Jingle Bells, jingle bells, jingle all the way …. Happy Monday!!! Hope everyone is doing great. The past few days have been really bad for California. Many fires around the state have destroyed homes and killed people. My family is ok because we don’t live close to where the active fire is but we get all the smoke which makes our air quality to be unhealthy. But, there is no place for me to complain about the air quality when I know there are other people who is suffering, it’s just so sad. On a more cheerful note, I made these cupcakes last week, they were a hit! 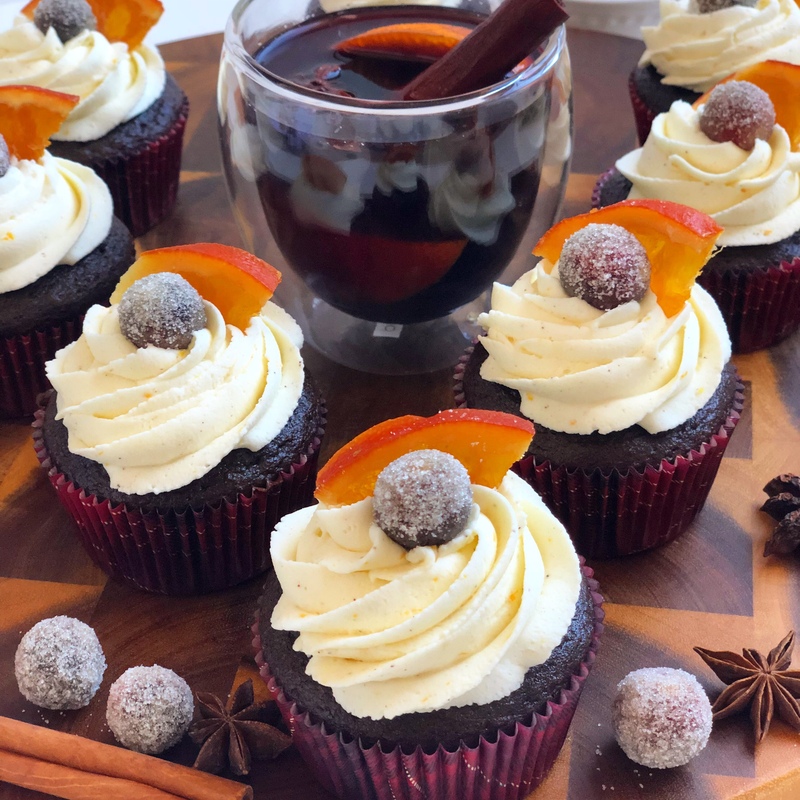 It takes a little bit of your time because you have to prepare the mulled wine first, but I would recommend that you make it the night before and just refrigerate it until you are ready to make the cupcakes. 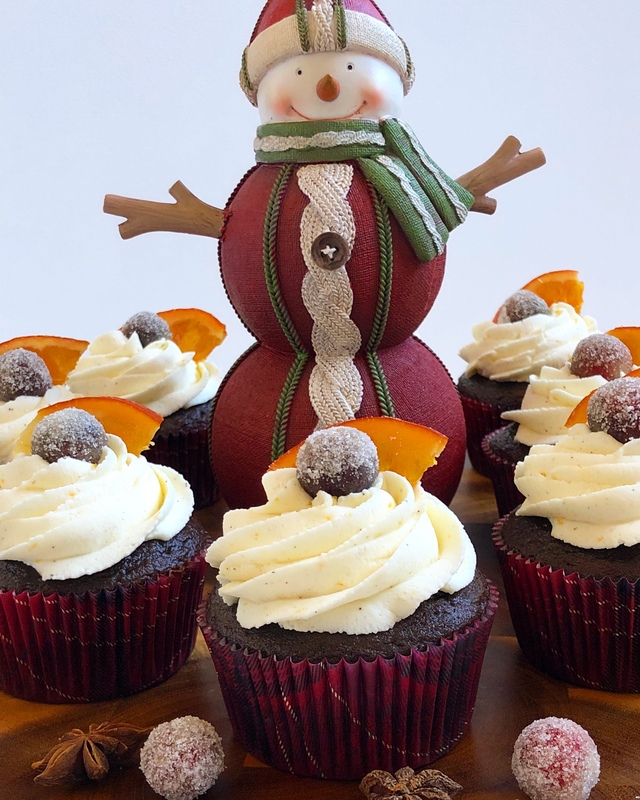 These boozy cupcakes are perfect for your Thanksgiving or Christmas gathering, they taste really good and look super pretty! For decoration, I made frosted cranberries (yep, you read it right! ), they aren’t difficult to make (instructions at the end of the page). 1.-In a small pan mix the wine and spices until it just comes to a boil. Remove from the heat, cover the pan with a lid and leave to infuse for about 1 hour. You’ll get 1 cup of mulled wine aprox. 3.- In the bowl of a stand mixer fitted with a paddle attachment, mix eggs, milk, oil, orange extract and mix on medium speed for about a minute until combined. 4.- Add flour mixture to the bowl and combine on low speed, gradually increasing speed to medium, until completely combined. Add mulled wine and beat to combine again for about 1 minute. Pour batter into prepared cupcake liners, filling just 2/3 full. Bake for 18-20 minutes, or until a toothpick inserted into the center of a cupcake comes out with a a moist crumb. 1.- In a bowl of a stand up mixer with the paddle attachment, mix mascarpone, sugar, orange zest, cinnamon and extract. Beat on low speed until smooth. 2.- Add the whipped cream to the bowl and mix it with the whisk attachment until it becomes stiff. PLEASE, BE CAREFUL NOT TO OVERMIX, OTHERWISE YOUR WHIPPED CREAM WILL BREAK. 3.- Frost your cupcakes. I used Wilton 1M tip. After you frost the cupcakes, you can decorate them with cinnamon sticks or any topper that you would prefer. I made frosted cranberries and it worked really nice. Here is the recipe for the frosted cranberries. Frosted cranberries : You’ll need 1 1/2 fresh cups cranberries, 3/4 cup of maple syrup and 1 white granulated sugar. Rinse some cranberries and sort to discard any that may be discoloured. Put in a medium bowl. Heat 3/4 maple syrup in the microwave just until warm. If it is too hot, the berries may pop. Pour over the cranberries and gently toss. Let them soak overnight in the fridge. Cover the bowl with a lid or plastic wrap. Drain all the extra syrup with a colander . Put one cup of granulated sugar in a baking sheet, and gently roll the cranberries, a few at a time, until coated. Let them dry until you are ready to decorate your cupcakes. This entry was posted in Recipes and tagged cake, chocoalte, Christmas, cupcakes, mulled wine, recipe, wine.